(3) Draw neat diagrams wherever necessary 1 (a) The flooring system for an industrial shed is as shown. Design the beam SB1, MB1 and the connections between them. Use I-section for beams and provide cover if necessary. 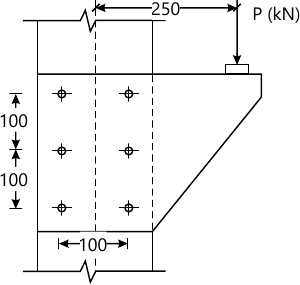 Top flanges of beams are at same level and embedded in concrete of 200 mm thick RCC slab. The parapet wall of 230 mm thickness and 1.2 m in height is provided on all peripheral beams. 1 (b) Figure shows the configurations of a Compound Fink roof truss having span as 12 m, rise 3 m with spacing of trusses 4 m c/c. Take a section 1-1 and calculate forces in members BC,FC and FG due load, live load and wind load. Also design the members. Assume suction pressure on both slopes as 5 KN/m2. (iii) the spacing between their webs is 200 mm. 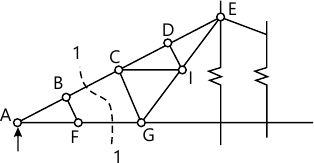 5 (b) Determine the load 'P' that can be safely applied on the bracket connection as shown. All the connection bolts are of 20 mm diameter and dimensions shown are in mm.